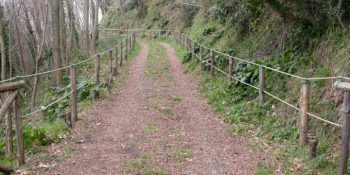 The nature trail n. 5 “Il Gran Cono” starts from the Piazzale (square) at an altitude of 1,000 metres above sea level in the municipality of Herculaneum at the end of the provincial road Ercolano-Vesuvio. At the moment, the Piazzale hosts a parking area for those who come by car. 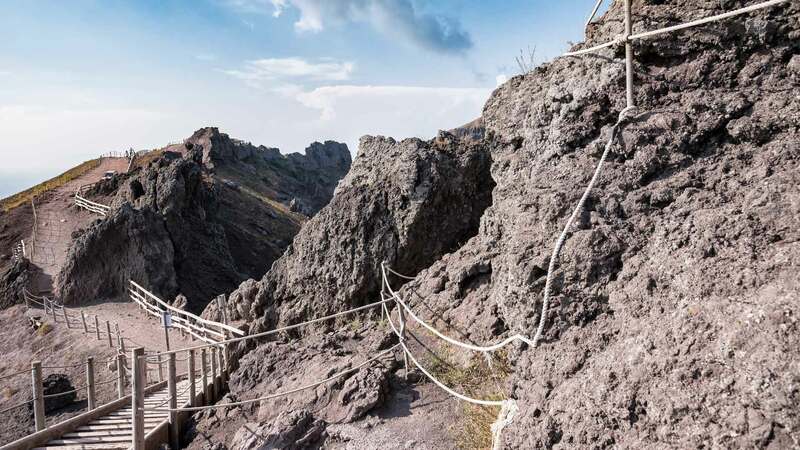 Before starting the climb, you can visit one of the info points of the Vesuvius National Park where you can receive useful information about the protected area and buy a map. From the Piazzale you can already enjoy a splendid view of the northern side of Mount Somma with the cognoli of Sant'Anastasia and Punta Nasone, the top of the ancient volcano which 1,132 metres high, opposite the cognoli of Ottaviano and Levante. While looking upwards, you can hold your breath and see from below what will be the ascent to the bottom edge of Sterminator Vesevo. For citizens residing in one of the 13 municipalities of the park community with a valid ID certifying their actual residence. For any other visitor, including travel agencies and other organizations operating in the tourism sector who do not intend to use prepaid vouchers for guided tours to the crater. For journalists with the right to report, upon notice to the Park Authority. At the exit of the toll booth, turn left, go along via Boscocatene, continue straight to the crossroads of via B. Cozzolino and go straight again. 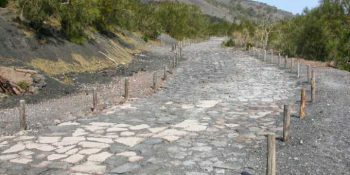 After about 2 kilometres you reach the crossroads, go straight following the sign Vesuvius. After about 300 metres, you can see on the right the info point of the Vesuvius National Park. Continuing for about 7 kilometres, you arrive at a junction, turn left, after about 2 kilometres you reach the square of altitude 1,000 where you can access the path, on which you can only walk. At the motorway exit of Torre del Greco, cross the roundabout and go straight on for about 300 metres, turn left and continue for about 100 metres. Then turn right and continue for another 100 metres, turn left to the intersection; turn right into Via E. De Nicola and continue for around 1.5 kilometres; at the junction turn right. after about 300 metres, you can find the info point of the Vesuvius National Park on the right. Continuing for about 7 kilometres you reach a junction, turn left, after about 2 kilometres you reach the square of altitude 1000..
For those arriving by plane from Capodichino airport, take the bus towards the central station Piazza Garibaldi. Even those arriving by FS trains need to get off at the Central station in Piazza Garibaldi. From the central station take the Circumvesuviana towards Sorrento or Poggiomarino via Pompei (for timetables and prices visit the website www.vesuviana.it), and reach the station of Ercolano Scavi. Even those coming from Sorrento or Pompeii can reach Ercolano Scavi on the Sorrento-Naples and Pompeii-Naples routes. In the external square of the station of Ercolano Scavi there is a bus service (click here for timetables and prices), and taxis that lead to an altitude of 1,000. Going up the path of the Gran Cono is a unique experience, for the thrill of walking along the crater of an active volcano and for the view of Campania and Lazio you can enjoy. 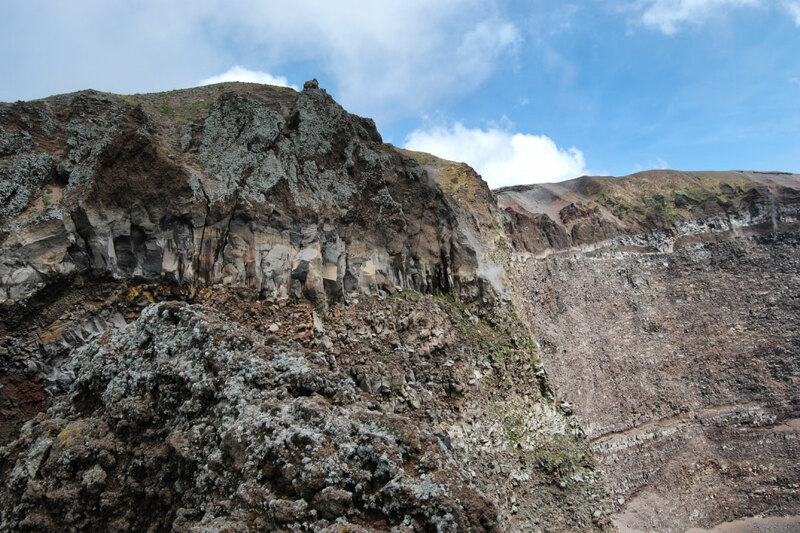 The main route runs along the western side of the crater rim, while an alternative route, under construction, will allow you to travel along the entire circle of the crater with a guided tour. The beginning of the path is located at the altitude of 1,000 of Erodano, where the ticket office is. 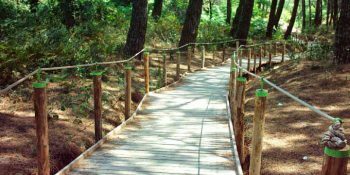 In order to follow the path, you must be accompanied by the alpine and volcanological guides of Campania. The climb continues gently for about 800 metres and is rewarded by a series of panoramic views which become more and more evocative along the various bends. The view is on Valle del Gigante, which in spring turns yellow with the presence of brooms. 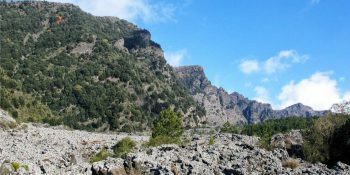 The valley separates the Gran Cono from the ancient caldera of Mount Somma, traced by the imposing cognoli of Sant'Anastasia (1,086 metres), Punta del Nasone (1,132 metres), up to the cognoli of Ottaviano (1,112 metres). 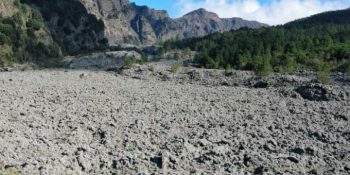 The route is marked on the volcanic products of more recent production consisting of ashes and lapilli and some small flows produced in the effusive phases of the eruption of 1944. 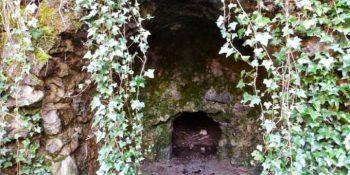 Arriving at the top of the volcano, you can see the Gulf of Naples and the whole city, and on particularly clear days you can enjoy the view of the entire plain of Campania and further north the plain of Garigliano up to the promontory of Circeo. On the right side of the view, the mountains of Partenio, Taburno and Matese are the background of the cognoli. 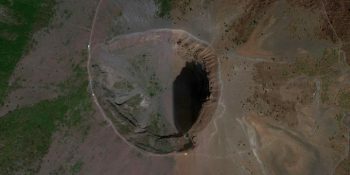 Several views along the way allow you to admire inside the crater, which after the countless changes made by the various eruptions, currently has an elliptical shape with a maximum diameter of 580 meters. 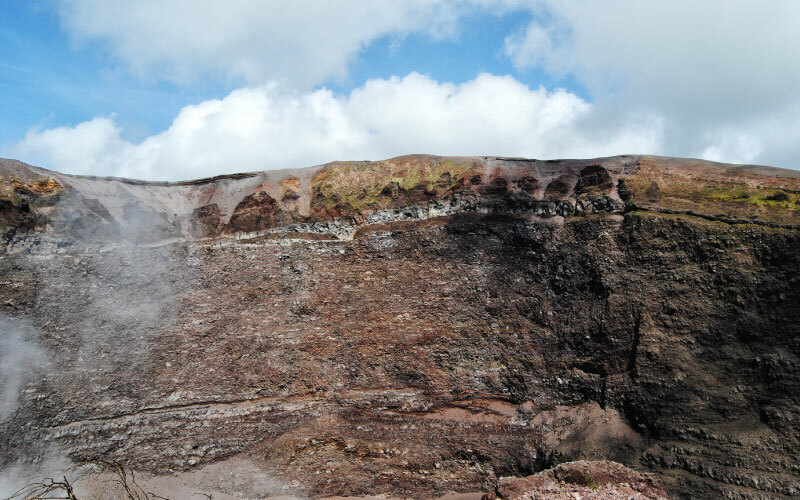 Along the inner walls, some fumaroles give us the feeling of a still active volcano, despite being in a quiescent stage. The crater and its particular substratum allow the nesting of different species of birds belonging to rocky environments of altitude and great conservation value, such as the common rock thrush, the black redstart, widespread in winter but rare as a breeder, the northern wheatear and the black-eared wheatear. Continuing along the path, you can see the southern coast of the gulf up to Sorrento and the island of Capri. 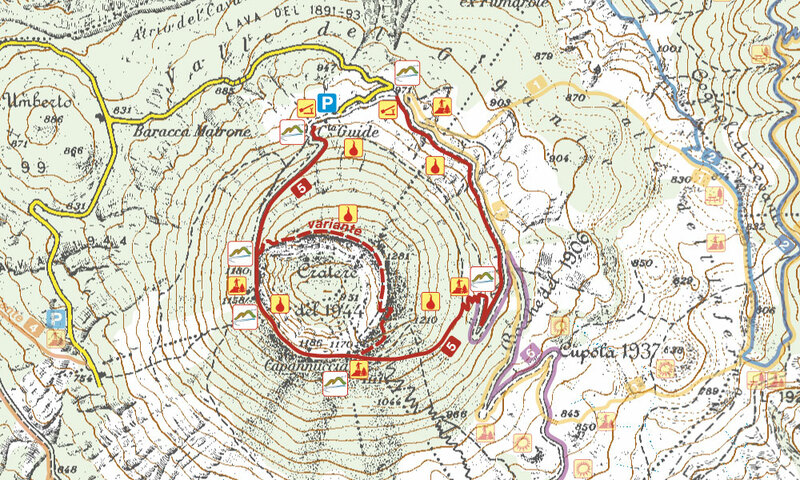 After the structure of the Capannuccia, which is the close destination, the path becomes rougher; it descends along the cone, whereby the view of the crater gradually disappears, while the vegetation gradually becomes more luxuriant. Here you can meet another species that is typical of rock environments, the common raven, whose metallic croak accompanies the visitor to the terminal part of the path. When you arrive in the square, you can stop and take in a breath-taking view dominated by the cognoli of Ottaviano, at the intermediate destination. The itinerary continues on the right downhill for a stretch overlapping with path n.6. 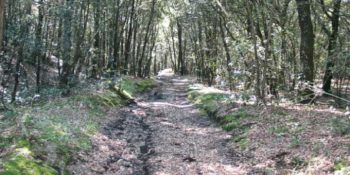 After about 600 metres, the path goes on the left to skirt Valle dell'Inferno and is in common with the homonymous path (n.1). 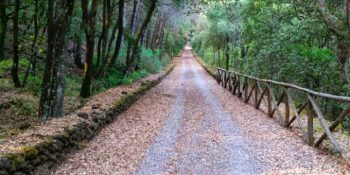 Having reached an access gate, you continue to the left for a short stretch of asphalt, until you get to the destination route, the square of altitude 1000 of Erodano, which coincides with the beginning of the path. The vegetation is characterized by the broom (mainly that of Etna), which is accompanied by other herbaceous species that are pioneer of the lava, such as the red valerian and the docks and sorrels. The amazing scent of the broom announces the arrival of the hot season and reaches the visitor even before starting the climb. 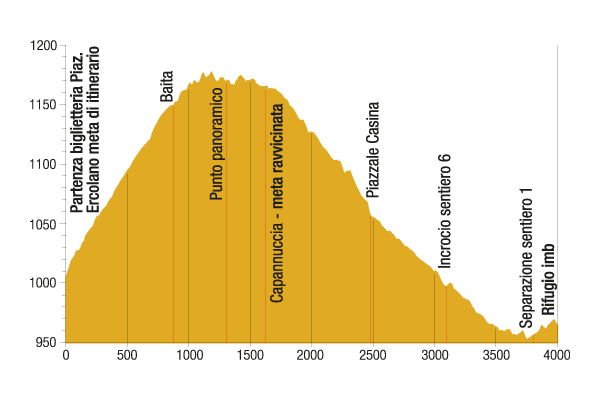 After passing the entrance, the ascent to the Gran Cono begins along a very wide path that is characterized by a series of extremely scenic hairpin turns. The climb allows you to admire from above the view of Mount Somma even better and to expand your vision towards the valley that separates the two volcanoes, Valle del Gigante, which in its western side takes the name of Atrio del Cavallo. The lava dates back to the last eruption of 1944 covered by the grey-silver lichen Stereocaulon vesuvianum. Still climbing along the hairpin turns, the view widens more and more on the Gulf of Naples, on the pinewood of the Tirone Alto-Vesuvio nature reserve and on the Umberto Hill. You reach a height of 1,118 metres, where you find the ticket office and from which the guided tour begins. 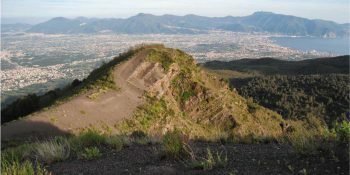 Once the toll is paid, you continue on a fairly wide path, along which there are a series of views over the crater of Vesuvius and on the upper edge, which can only be reached by scholars. The arrival at Capannuccia at 1,170 metres of altitude is the close destination of the trail. 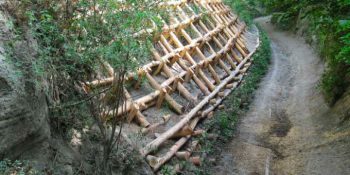 At the moment, it is not possible to cover the entire ring (intermediate destination and itinerary destination) as some interventions are being carried out to make the route safe with naturalistic engineering techniques.